A brilliant printer in Canon's top range of Home printers, deserving of anyone wanting a home printer that can give unrivaled photo printing results while still churning out the homework. The TS8050 may be overall better value, but this printer still packs a punch. Home users that want the best photos they can get in a home printer without investing in an expensive, dedicated photo printer. 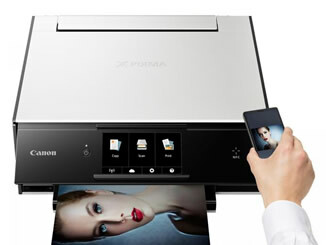 It's particularly suited for people printing from multiple sources, favouring printing from SD cards, mobile devices etc. It can still handle everyday prints like you'd expect from a home printer, but boy do those photos look good. 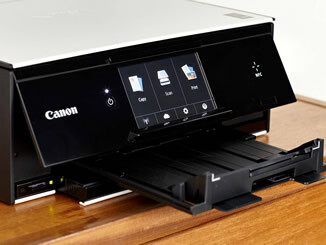 Ultimately, the TS9050 is built to let you print excellent photos however you want to, and it does it well. The main benefit of the TS9050 over lower models is the excellent, and large, touch screen. It opens up far easier ways of interacting with your prints, to the point you can edit photos on SD cards to apply Instagram-style filters, and print photos directly from Facebook etc. The Canon TS9050 is not a speedy machine, with normal text documents coming in at roughly 12 pages per minute, and colour graphics dropping to 3.5ppm. Full colour A4 pages take a while, coming in close to 2 minutes, but that's fairly typical for high quality photos, and what good prints they are. Print quality is fantastic, hence the strong overall rating of the TS9050. Normal document prints come out well, with decent text and strong colours, but the printer really shines when printing photographs. The sharpness and colour accuracy really is fantastic, and the TS9050 can handle any photo requirements whether it's skin tones, sepia or vivid, bright colours. The ability to print from so many different connections, or NFC on the phone, is brilliant, and the quality no matter what is pumped through it is top notch and some of the best we've seen from a home printer. The TS9050 takes 6 different cartridges which can all be replaced separately when they run out. You have one black, the PGi-570, dedicated to document printing, plus five colours in the CLi-571 range that print your photos. These include a grey to expand the possible colours your printer can achieve, giving far better printing results. Each cartridge comes in two possible capacities, standard and XL versions. This Canon printer lacks the 2 extra colours (light cyan and light magenta) that dedicated photo printers have to further increase the possible colours, so dedicated photographers should look for printers using them, but for everyone else these cartridges are more than enough. 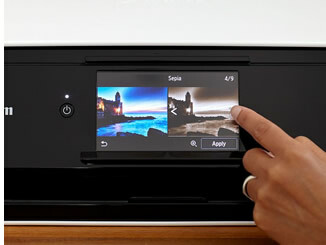 Running costs are competitive with other home photo printers, unless comparing them to more budget models using only 4 inks, but it is not suitable for a document workhorse or your black costs will quickly mount up. There are a fantastic range of compatible inks for the TS9050 that can help with this, giving you amazingly low costs of around 0.6p per page. Any home users wanting to print normal documents and photos, that do not want to plump for a full dedicated photo printer. Excellent quality in an easy to use package, the Canon TS9050 is an excellent machine. Unless you like to print photos from multiple sources, the TS8050 is probably still better value overall, but the 9050 is still a fantastic machine.